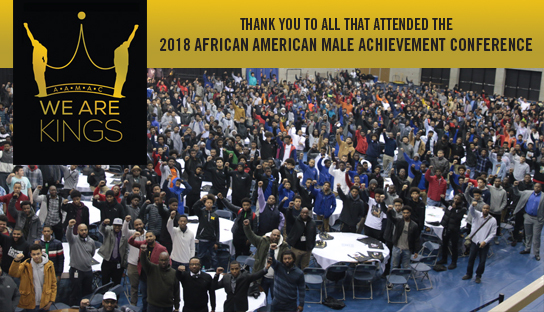 More than 800 African-American boys took part in the third annual African American Male Achievement Conference Wednesday. The theme of the event at Grand Rapids Community College’s Ford Fieldhouse and Applied Tech Center was “Challenges, Choices and Change.” The young men from high schools throughout Kent County listened to speakers in a large group and then broke into smaller conversations with local African-American professionals. Students who took part said it was eye-opening and showed them there are opportunities out there. “A bunch of positive role models that grew up in the same neighborhoods that we did, same struggles that we all had. It’s just good to see how they came together to help us out,” Ottawa Hills High School Senior Kaylin Howard said. “I’m shocked about a lot of people telling me they were in low-income families and how they have changed their life around and changed their ways and went to the good way, good path, and that actually encouraged me to change my ways and go to a good environment,” student Kevon Taylor said. The event was presented by the Urban League of West Michigan, Grand Rapids Community College, Grand Rapids Public Schools and Grand Valley State University. If you’re an African American adult professional who is interested in becoming a mentor in our community, contact Commissioner Joe Jones of the Urban League of West Michigan at jjones@grurbanleague.org. Listen to "Joe Jones Urban League of West MI" on Spreaker.